Today marks the start of the last week in April and at last finally it feels as if Spring is here at last…although we may have skipped straight to Summer! 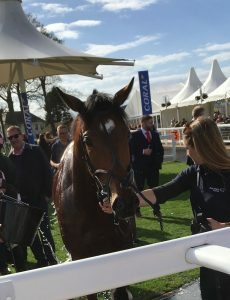 Having put up with an exceptionally cold and miserable winter it’s a bit of a shock to the system for us all but especially for the horses; this was seen in particular at Cheltenham last week, where they experienced the hottest April afternoon for some time. 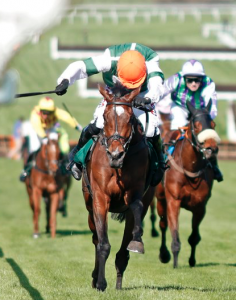 It was great to see some nice Spring ground for the horses and it’s been a long time coming – many of them have been waiting for weeks for their chance – and to finish off the two days with a win in the fillies’ juvenile handicap hurdle by Stylish Dancer was brilliant for the team. On Wednesday however Ella and I were excited to be able to take a break from our usual office life with an invitation to the Craven meeting at Newmarket – talk about fishes out of water! Tom Jonason from Weatherby’s Bank had invited us to the launch of the inaugural Racing Secretaries’ lunch and it was great to catch up with some of our counterparts from other yards, swap stories and compare experiences. 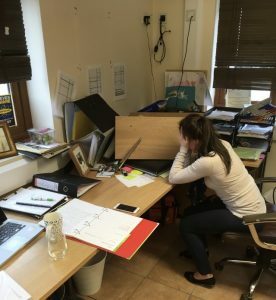 One subject which continues to be at the forefront of industry worries is the nationwide shortage of stable staff and how it can be tackled going forward. This is most definitely an issue which will not be solved overnight, and at Lodge Hill we are particularly lucky to have attracted a dedicated and hardworking team who do a great job keeping everything going come rain or shine. A lot of yards are finding the current recruitment climate troublesome, and it is interesting to hear about a variety of new innovations in working practices which are being introduced to make the role more attractive. 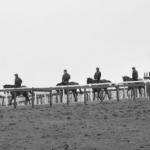 The next few months could be a testing one for the racing industry as far as staffing is concerned, and it could be that the near future brings about some drastic changes to the way racing staff are employed across the industry in order to maintain the high level of care that racehorses have always been afforded. This weekend saw a mammoth mission to get fourteen horses and several staff up to Ayr for the two-day Scottish Grand National meeting. The team were delighted to see both Value At Risk and Azzuri pick up valuable prizes on the Friday, both putting in exemplary rounds of jumping under Harry, and whilst the crew came home without a win on Saturday the horses all ran very well in good company. Finally we are eagerly awaiting some new arrivals in the Lodge Hill office, with an incubator full of eggs! They eggs have now been in the incubator for eleven days, and all being well we expect them to start hatching during next week. We will definitely be keeping you all up to date with how they get on, and hopefully the new arrival can be lucky mascots for the yard in time! The Quest for 200…It’s On!